STUTTGART, Germany — Sgt. Maj. Carlton Kent is on the road again. 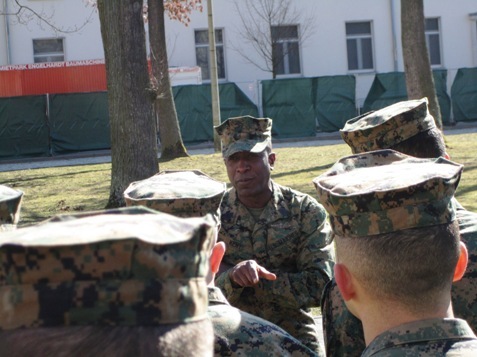 That’s as good of a place as any to start when acknowledging that Marine Corps Times is traveling with the Corps’ senior enlisted adviser as he visits several locations in Europe. I hopped a plane Sunday with Kent and his staff, arriving about 3 a.m. local time here after a a brief refueling layover at Lajes Field in Portugal. I’ll be reporting several stories out of this trip, but a good place to start is that Kent travels relatively conservatively. We hopped an aging Marine DC-9 jet from Andrews Air Force Base, traveling with Lt. Gen. Dennis Hejlik, commander of Marine Corps Forces Command, out of Norfolk, Va., and Lt. Gen. John Paxton, commander of II Marine Expeditionary Force, out of Camp Lejeune, N.C. Lunch and dinner Sunday consisted of ready-made meals we brought on board, including “box nasty” sandwich meals picked up in Portugal during the layover. For now, I’ll sign off. Kent and his staff are planning a “moto run” with Marines here early in the morning, and your faithful Marine Corps Times correspondent will be participating while reporting. Yeah, that’s right. Ready the oxygen.